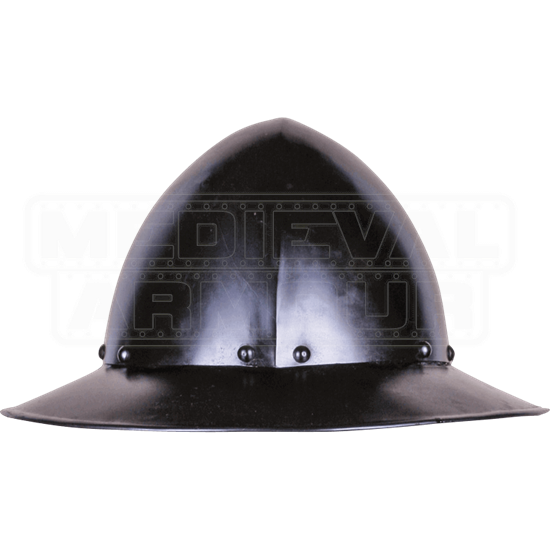 For LARP or historical reenactment, take on the role of an 11th century infantryman with the Ralf Darkened Kettle Hat Helm. Also referred to as ÃƒÂ¢Ã¢â€šÂ¬' the helmet of the commoner, the kettle was commonly used throughout Medieval Europe. Handcrafted from 18-gauge steel, this helmet consists of a conical dome and wide brim. A central ridge and rivets provide extra protection against blows. Leather buckle straps adjust the fit under the chin. The darkened finish is due to an electrochemical treatment, which aids in rust resistance.